Yoga creates the space for deepening our connection to our body and mind as manifestations of energy and conduits of Consciousness. Through practice we deepen our appreciation and understanding of the laws of nature that continually vibrate and shape our reality. Yoga helps us to attune to these laws and see clearly where our inner work lies. These laws protect, heal and nurture our growth and when aligned with awaken us to our highest potential. Discover, explore and awaken to your elemental self. Gain greater knowledge in this practice immersion of both the gross and subtle tattwas – elements. The Tattwas are responsible for how we feel and think. If the tattwas are pure and healthy we experience vitality, clear thinking and make decisions. Explore from a yogic view and embody practices. Deepen your understanding of the natural forces behind our daily experiences and evolution. 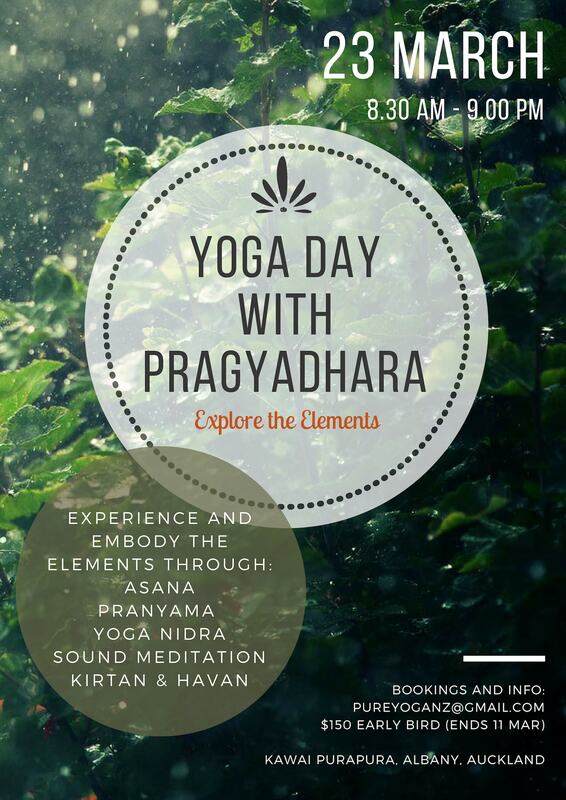 Enjoy a range of powerful tools (asana, pranayama, mudras and bandhas, yoga nidra and meditation) that can be added to your practice and applied in daily life. Nourishing lunch (vegetarian/vegan), healthy morning and afternoon tea, chai and kombucha are included. Dinner is a shared meal, bring a plate. Prema Café the onsite café is open from 8am. For bookings and enquiries please contact pureyoganz@gmail.com. Relating and connecting elements to their associated endocrine glands and chakras. Psychodynamics – perceiving, relating and understanding through these lenses. Body/Mind links. Havan (ancient Vedic fire ceremony chanting 108 rounds of the universal mantra for healing) Macrocosmic & microcosmic connection. Kirtan (special invited guests) connect with the natural state of wholeness and bliss inherent in us all. It is my privilege and joy to facilitate your yoga day.